St Johnstone have handed a short-term deal with Murray Davidson to allow the midfielder to continue his recovery from serious injury. The 26-year-old, whose season was ended in January, was due to be out of contract this weekend. 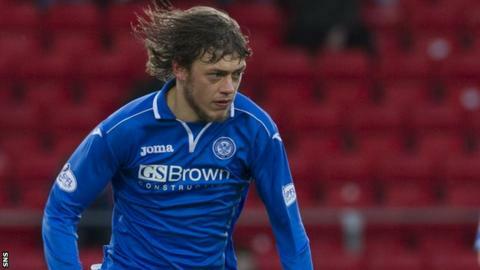 St Johnstone manager Tommy Wright told his club website: "I'm delighted he's agreed the short term deal and both parties will revisit it in August." Davidson signed a new one-year contract at McDiarmid Park last summer. He had initially rejected a new deal but returned after failing to find a suitable club in England. Davidson, who picked up the torn patella tendon injury against Hearts, first joined St Johnstone in 2009 from Livingston. "We're glad Muzz is making good progress and the club had told him that we would give him the time to get fit," added Wright. "I know and Saints supporters know what an asset a fit Murray Davidson can be to the team."